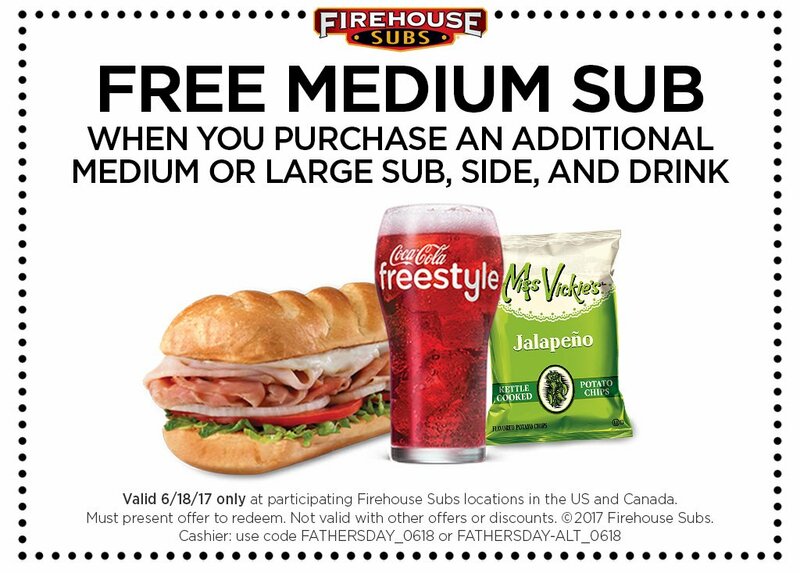 Firehouse Subs - Use this coupon to receive a free medium sub with the purchase of a medium or large sub, fries, and drink. Bertucci’s - Visit their Father’s Day page, upload a picture of your dad and say why he inspires you and you’ll receive a coupon for a free small pizza with the purchase of another entree. PDQ - Earn a free combo meal with the purchase of another meal, including kids meals. Beef O’Brady’s - Dads get a free meal of up to $10 with the purchase of another $10 meal. Spaghetti Warehouse - Dine in and enjoy a free 15-Layer Lasagna or Original Recipe Spaghetti entree. Texas Steakhouse & Saloon - Eat at Texas Steakhouse & Saloon on Father’s Day and you’ll receive a certificate for a free entree, eligible to be used on a future visit. Shoney’s - Shoney’s is offering a Father’s Day Food Bar, featuring garlic shrimp, fried chicken, peach cobbler, and more. Dads will also receive a free slice of pie. First Watch - Dad’s receive a free small bag of coffee with the purchase of a meal. Medieval Times - Buy one adult ticket using the code DAD17 and get a free ticket. TCBY - Dads get a free (unspecified) treat on Father’s Day. As a reminder, these offers are not affiliated with AHR and are available at participating locations only. Happy Father’s Day!